Listen to the podcast. Find it on iTunes. Read a full transcript or download a copy. Sponsor: VMware. Managing applications sprawl has long been a burr in the IT saddle, and the popularity of software-as-a-service (SaaS) applications hasn't exactly been a balm on the situation. As with on-premises applications, the key to SaaS and hybrid apps is getting better visibility and operational data on the applications' health, and then automating the processes across standardized methods and controls. Easier said than done. 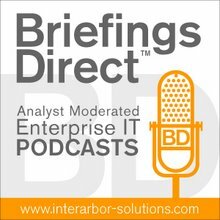 That's why the next BriefingsDirect IT innovator interview examines how an online pharmaceutical services provider, Millennium Pharmacy Systems, Inc., has successfully deployed mission critical SaaS applications, and then implemented advanced IT management and operational efficiency processes and systems to keep all the applications up to date, compliant, performant, and protected. Gardner: You deliver your value via SaaS. What has become key about managing the applications well? Ravenna: Depending on what the customer needs, we may set up the entire environment for them, networks, wireless, scanners, and printers, or they get to us through their own equipment and internet connections. But it's all SaaS. Our SaaS application has 250 separate SQL databases on seven SQL Servers, running in a VMware environment and that helps me dramatically cut my licensing cost for SQL Server and helps to manage them in a high availability way. I've been here about 14 months. One of the things that we looked at doing right, when I came in, is taking both the data centers that we have -- one is owned and one is a co-located facility -- and eliminating a lot of the older hardware that we had. What we looked to doing first was consolidating, getting rid of the older hardware, and moving us to a much better state. We are now about 85 percent virtualized. Our primary datacenter is for our customer-facing application, a SaaS application, built on SQL/.Net and Silverlight, for about 250 nursing care facilities on the East Coast. Gardner: What have you gotten, in addition to efficiency, perhaps in terms of reliability? Ravenna: We had a couple of older Dell blade chassis, and inevitably you would lose the power supply or a server, and I just don’t have that now. From an operational standpoint, it just helps to be more efficient. It has the ability to turn new servers up faster. It’s not something that we do all the time, but it helps me be much more efficient. I have a fairly small staff, and my goal is to let them sleep at night. By having more VMware in place, as I said, about 85 percent virtualized, it allows me to do that. If the server fails, they applications move to a different server. I have the ability to upgrade the servers on the fly. It allows me, from an operational standpoint, to be more secure in what we're doing. And it helps me lower my cost, because I am not as worried about my HVAC. I have less equipment to worry about. I have less break-fix to worry about. All in all, it helps me be remarkably more efficient. Gardner: Let’s learn a bit more about Millennium Pharmacy. Ravenna: We host a system for about 250 nursing-care facilities. This basically controls all of the medications that a patient would need. It does our medical reordering and passes that information in an entirely integrated fashion back to our in-house systems for billing and filling of prescriptions. As a patient, you don’t have much time with your nurse. The nurse is typically gathering your drugs. We have our own pharmacies that service those homes. We deliver, in a cellophane sealed package, your medications. We're working to implement the new HIPAA regulations so we can be even tighter in that space. These packages say, "Mr. Smith, take this at dinner time." There's a barcode for every drug, and when the nurse gives them the drug, they use a wireless scanner to scan that barcode and it automatically reorders the next set of drugs. We give patients about a three- or four-day supply, as opposed to 45- or 90-day supply, which cuts the cost for the nursing care facility itself. Then, we manage all of that data back to our other systems, that manage the filling of new prescriptions and billing and then we deliver every day. The healthcare space is fairly stringent, and and getting more so with the new HIPAA regulations. New ones just came out on March 26 of this year, and the enforcement and penalties are much greater. There’s some significant items that have changed, but really it’s the enforcement and penalties, things around encryption, and protecting customers' data. We also have to protect confidential information and so we need to be very secure. We're working to implement the new HIPAA regulations so we can be even tighter in that space. Gardner: This is all done through SaaS and cloud. There are no on-premises installations of your application. Is that right? Ravenna: Only one facility out of our 250 has their own system. They are large, and one of their requirements was to have their own, but we support the rest of them, approximately 250, all cloud-based. They can get to it from their Internet connection. Gardner: We're talking about being mission critical, people getting their medicine. We're also talking about being highly efficient. What were some of the requirements in terms of the infrastructure, particularly as we look now towards managing so many different instances and the ability to be agile and fire up new versions of VMware and to get those apps up and running? What were some of your requirements just from a management perspective? Ravenna: It had to be easy. I have three system engineers. I only have a couple of network engineers. We support, on the network side, approximately 250 VPN tunnels out to customers, and as you said, it's mission critical. If people don’t get their drugs, it’s a bad day. We take that mission very seriously, making sure those systems are up and running. From an operational or management standpoint, we really need to be monitoring to know what’s happening and when. Having VMware in that mix gives us the ability to make things consistent, but it also helps to reduce our cost from a licensing standpoint and helps us manage them better, because we can see what’s happening at any given moment. One of the nice things about VMware is that it’s just rock solid. We're kind of weary of knocking on wood, but it’s rock solid for us. It gives us the ability to move applications on an as-needed basis. We can upgrade things on the fly. In one data center, we are currently on 5.1, and we're moving the other data center to 5.1. Gardner: So as a mid-market organization, you're resource constrained, you just don’t have a huge stuff, and you need automation. You need to have the ability to manage things, perhaps remotely. It lets us be a lot more efficient with what we are doing. It lets us manage more efficiently. So it's this notion of total approach to management, rather than silos, rather than integration of different management approaches and products together. That just wouldn’t fly. What have you done to improve management? Ravenna: There are a couple of things. We're evaluating vCenter Operations Management Suite. One of the things that it has let us do is dramatically reduce the size of our virtual machines (VMs). Typically, if you're moving from a physical environment, VMware is a lot more efficient and it’s really kind of surprising seeing some of the reports that come back from vCenter Operations Management that tell you, realistically, you are running this server with six gigabytes of memory, but you are only really using one. It’s a little bit spooky to look at it and ask if we really want to go that far. In some cases we would say, "Yes, let’s go ahead and do that," and it’s been, for the most part, dead-on. We've looked at a couple of things where our gut didn't say it was the right thing, even though it probably was. There's still a little bit of that old-school mentality that says you need to get more resources, when in fact the server may not even need them. It lets us be a lot more efficient with what we are doing. It lets us manage more efficiently, because I can put more databases or more servers on each VM host. Gardner: What was the ramp-up in terms of the skills and the running of the management system? Ravenna: For vCenter Operations Management Suite, it wasn’t too bad at all. We were talking to VMware, and they said it would be potentially beneficial. We started up, ran it, and there really wasn’t that much training that was necessary. The harder thing was when they came back and said we were over provisioned. That was making that rationalization that VMware is a lot more efficient than physical hardware. It meant taking some of our servers from 4 GB RAM down to one half that, because that’s where they needed to be. In some cases, you want to be a little bit safe. You ultimately find out that the tool was right, and you were being gun shy. Gardner: So when you look at the total picture, you need to be agile and able to move your resources quickly. What's next on your radar? Ravenna: I have an overriding philosophy, after doing this for last 20 plus years. The simpler I can make it, the more I get to sleep. Sleep is a recurring theme and realistically, that means fewer calls during the night. We're looking to move to vCloud Suite, in particular Site Recovery Manager (SRM), and using the vCenter Operations Management Suite to allow us to be more efficient. It just helps us work better and faster. Some of the key components will help me to be as efficient as possible. I may eventually need to build out virtual data centers, so the VMware vCloud Director helps me. My whole goal is to be able to make things as simple as possible and as easy as possible to manage, and these tools let me do that and be more efficient. The VMware Operations Management Suite and the vCloud Suite will help me get there. Those are some of the key things I'm looking for in the future. For me, having multiple data centers, the ability to have VMware SRM, is just a great thing. It’s getting ready to thunderstorm here, and having the ability to move my services to a different data center that’s about 35 miles away is key. I'm very leery about putting my data just in a cloud with everybody else. It would have to be very specific to the healthcare space. Gardner: It’s pretty interesting that the notion a one-size-fits-all, plain vanilla, public cloud wouldn’t be attractive to you. Ravenna: I'm very leery about putting my data just in a cloud with everybody else. It would have to be very specific to the healthcare space, because you end up signing a business associate agreement with me. It would have to be what I would term carrier-class facilities that can prove they are in the healthcare space, dedicated to being there, and abide by all the HIPAA Rules. We have all of the things like PCI and SSAE 16. Those type things really need to be there and geared toward the healthcare space specifically for me to be able to look at them. I'm not a guy who wants to understand electricity or heating and ventilation, but unfortunately in the world that we live today, in the mid-market space, you have your own data centers. You have no choice. You have to play in that game. Anything that I can do that helps me to address those issues to run cooler or run with less equipment is just all goodness. Gardner: How do you convince the bean counters that this is the right thing to do? Ravenna: It’s not necessarily a metric, but when you're spending less year over year on equipment, that’s evidence. Every server you buy is going to be in the roughly $5,000-$10,000 range. If I'm not doing that, I'm agile and nimble in being able to say that I can accommodate that. That's opposed to the old process which was, get the capital done, go to finance, and wait six weeks to get a server, and then put it in. Inevitably there is something that’s constrained. So that six-week lead time becomes eight or ten weeks. It just helps me to move faster and spend a lot less capital money. One of the things that I mentioned a little bit ago was licensing from a SQL standpoint, but things like backup that are running on a per-processor standpoint within VM drop my overall cost. Anything that I can do that helps me to address those issues to run cooler or run with less equipment is just all goodness. One of the things that it’s helpful as well is the dashboarding ability to be able to show what’s going on, what’s happening, and what the environment looks like. vCenter Operations Management Suite gives me that and it's all goodness. If you're comparing the cost of, say, a two processor server, and you are going to go buy four, five, or six servers, take one of those servers and put that investment into VMware and vCenter Operations Management. You're going to be happier in the long term.